If you take care of your car, the car will repay you by taking care of you, such as simple maintenance of carbon fiber parts. But one of the biggest issues with headlights is how condensation can form under the lens. Condensation will cloud up the headlights and cause discoloration as well. The combination of these issues will cause reduced visibility which means that you will have less illumination to see what is in front of you at night. The actual condensation is caused when the lens of the headlight is at a reduced temperature compared to the lights themselves. Once the heated air of the headlights hits the lens moisture will form and create the condensation. Normally, the headlights are sealed to prevent any moisture from entering. However, headlight lenses may develop leaks over time that can let the outside moisture seep into the interior and create condensation. In order to do this, you will need to properly seal your headlights so that moisture can no longer seep into the space between the lens and the headlight itself. Remove the Headlight Assembly: Be sure to disconnect all of the electrical connectors and pull the headlight out of the vehicle. Most headlight removals will require a few simple tools, but for the most part they are made to be removed easily since these are parts that are often replaced. A screwdriver and ratchet is often the only tools you should need. Remove the Socket and Headlight Bulb: You’ll want to have a dry cloth or rag handy to remove any moisture that is currently on the outside of the headlight. A blow dryer is an excellent tool for removing moisture on the inside of the headlight. If there is any water inside the lens, then you may need to drill a hole, but tilt the headlight first to see if it drains out by itself. Inspection: Check the headlight for any leaks, cracks or damage that will let the moisture in. For small cracks or holes be sure to use urethane sealant as it works quite well. 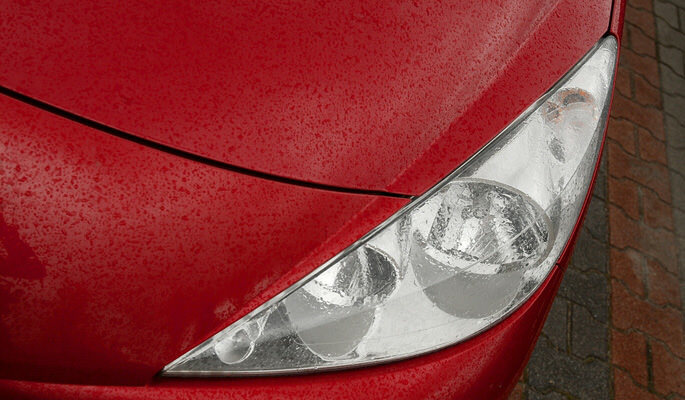 For larger cracks or damage, you probably need to replace the headlight itself. Teflon Tape: This should be used to seal around the bulb socket and prevent any moisture from entering through this pathway. Plus, replace the bulb as well. Inspect and Seal: Next, take some sealant and locate where the headlight lenses meet the housing. Inspect for any damage and apply the sealant to any holes or cracks that you find. Allow the silicone sealant to dry for about two hours before replacing the headlight. Replace the Headlights: Now you should replace the headlights and hook back in all the connectors. Test the lights to ensure that they are working and you should be ready to go. ShopPMLIT has the automotive parts and car lighting accessories for your car or truck. Offering the best in auto lamps which include individual bulbs or our popular CCFL, Plasma and LED lighting systems, ShopPMLIT has the aftermarket auto lighting parts for your needs. We provide everything from the headlights to the taillights and many lights in-between.